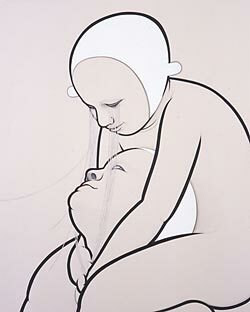 Kumi Machida is certainly represents a new generation of the Japanese art following Takashi Murakami and Yoshitomo Nara. 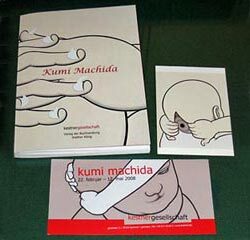 I met Machida-san and her works for the first time in Frankfurt am Main in April 2002. Nippon Connection - a large scale film festival dedicated to the contemporary Japanese films - invited Machida-san to participate in its related cultural programs. In retrospect I wonder whether Machida-san was at the time still muddling through the initial difficulties as an artist. She earned her living with part time job at restaurants and aimed at finding opportunities to show her works to the public. The important difference between Machida-san and other ordinary artists is that she searched for opportunities in overseas as well. She received the first offer to hold an exhibition from Netherlands and the next offer from Nippon Connection. Postman is a baby and his figure is caricatuarized according to the vulgar design tradition. From this time onward, her works usually feature similar figures. Invitation card to her exhibition at Nishimura Gallery in 2006. I found "postman" in her exhibition at Mousonturm in Frankfurt. "Postman" was a starting point for her successful works in the following years, though the majority of the exhibits were sculptures. When I met her after my return to Japan at the exhibition in the MOT in January 2006, she had already established her unique style and stood out from the other artists of the group exhibition. 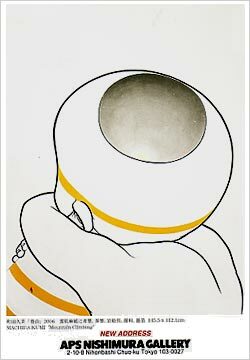 As I am not a specialist in this field to explain her technique, I quote here the explanation of her home gallery; "Some remarkable characteristics of her work include clear-lined draftsmanship in sumi ink on Kumohada linen paper, and a minimal sense of color fleshed out with mineral pigments." If people see her works only on the internet, they might believe that her works are "super flat". 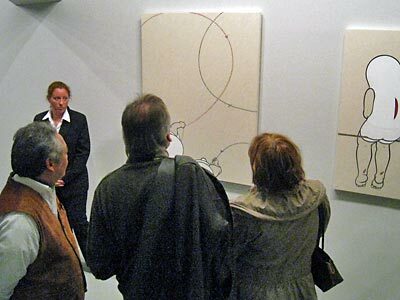 But, her real works have diverse and fine undulations and they give warm nuances to her works. (*) "Sumi" is traditional black ink in Far East for writing letters or painting. "Kumohada" is a kind of Japanese paper. When we were chatting at her exhibition in Nishimura Gallery, she told me that she dreamt of staying in a cold country like Scandinavia to add new spurson her creative activities. This word made me work on her invitation to Denmark, because I started to live in Copenhagen in summer 2006. It seemed to me rather easy to get scholarship for her from the Japanese government. But, I was not satisfied with her simple stay in Denmark. I wanted her to be known to the Danes. It was not an easy task to persuade Louisiana, the most authoritative contemporary art museum in Denmark, to give her a chance to hold her exhibition. However, everything went favorable to us. Machida-san won the Sovereign Asian Art Prize in 2007 and this prompted the Kestnergesellschaft in Hannover to invite her in 2008. I visited the opening of the exhibition at Kestnergesellshaft and was impressed by the interest expressed by the German visitors to her works. Snaps from the opening of the exhibition at Kestnergesellschaft in Hannover. 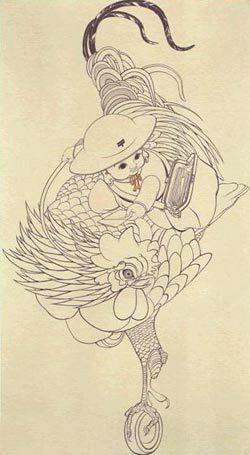 The international success of Machida-san convinced Lousiana of her importance as a flag bearer of the new art trend in Japan and invited her as one of the tree Japanese artists in the context of "MANGA! Japanske billeder" which took place between October 2008 and February 2009. 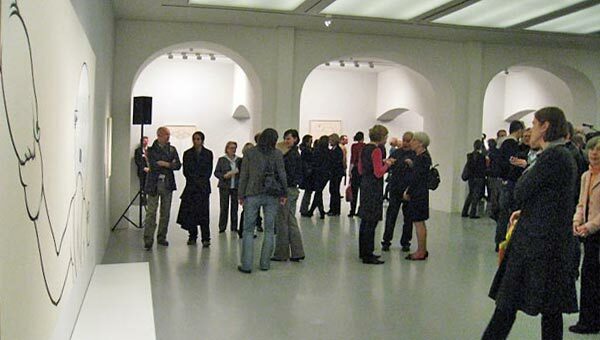 The exhibition was divided into two parts: manga proper and contemporary art. I knew the manga part, as it was originally created by the Museum für Angewandte Kunst and toured to Louisiana and I visited Frankfurt to see the manga exhibition. However, I could not see the exhibition in Denmark, as I already had already left Denmark for Japan when it started at Louisiana. Anyhow, Machida-san was warmly accepted in Denmark and stayed there for a year or so and got inspirations for her further work. Invitation card to her exhibition at Nishimura Gallery in 2010. A small man bears a small cross on his back. Rockig Horse is the biggest work at the exhibition (140 cm * 113 cm). The exhibition in Nishimura Gallery which started on the 14th of December is the first exhibition of Machida-san in Japan after her return from Denmark. I wondered what had changed in her after her long term stay in Denmark. She did not admit anything during our short conversation. However, I saw the omen of change in her style. She started to use loud yellow, though she used to use only black and white and a bit of red ink on flesh colored paper. Also small white lucent balls were on the picture: symbol of coldness of Denmark? There was more direct influence - or just joke - from Denmark. For example, she painted a Danish flag, though colored white, on one of her paintings. 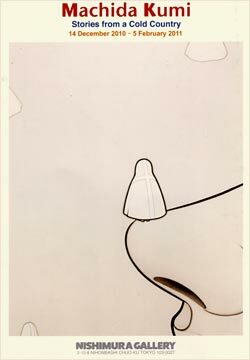 She also painted a small picture with a famous seven chair of Arne Jacobsen. But, this might be only a superficial impression. This time she painted a series of small pictures with arrow or house shaped objects. This was unusual, because she kept painting caricaturized babies in recent years. She only commented to me that she was so depressed to paint humans. She is going to participate in the cultural program by the Japan Society in New York next year. She can further widen the horizon of her activities. I unfortunately missed to buy her works in right timing. Now the largest work of Machida-san is priced six million yen and already far away from my reach.